United will be hoping goals from Daryl Falconer can spare them any relegation troubles next season. Craig Morrison insists news of St Andrews United’s reprieve from relegation out of the East Premier League came totally out of the blue. 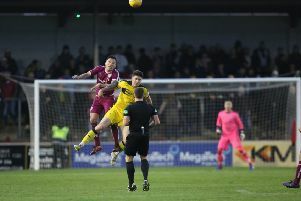 United now know they won’t face the dreaded drop to the North Division due to Kelty Hearts’ move out of the junior game. The Central Park side made no secret of their desire to join the SFA’s pyramid system with it being confirmed on June 8 that they had joined the East of Scotland League for next season. This means Newtongrange Star will now not face relegation from the Super League to the East Premier and Saints will also retain their place from last season. Boss Morrison said: “In the juniors there are always rumours and we knew for a while Kelty wanted to go down that road. Saints have already arranged a programme of pre-season friendlies, including their annual football festival at Barnetts Park on July 15 and 16 before they host Culter on July 22 and Petershill on July 29. Those games will still go ahead as planned, with Morrison saying the games would have proved suitable preparation whatever division the side was in. He added: “When we were planning to play in the North Division we had to show it the respect that it deserves and arranged some tough games for ourselves against testing opposition. “Nothing will change about that. Morrison made a few moves in the transfer market last season, bringing in several players from his former club, Dundonald Bluebell. He expects to retain the core of the squad and would like to add some more faces to it. The manager added: “I’ve spoken to the committee and we’ve talked about the fine lines between failure and success. “So I don’t want to dismantle the squad and would just like to add some key personnel into certain areas. “Staying up gives us a different dynamic now and the approach is to go for the right people.